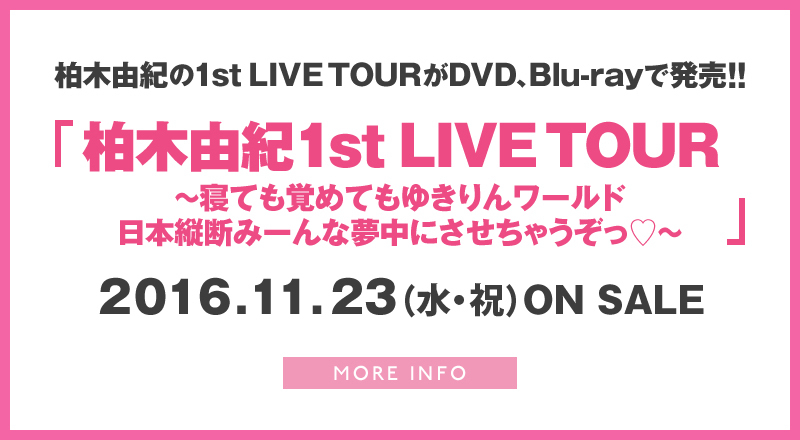 The DVD and Bluray of Yukirin’s 1st Solo Tour will be released on November 23, 2016. The concert was recorded on May 12th at NHK Hall. The DVD comes with 2 DVDs and a CD. The Blu-ray comes with Blu-ray disc and a CD. The bonus CD contains an unreleased song with the lyrics written by Yukirin. The Limited Edition for both DVD and Blu-ray includes a 20-postcard set and special jacket sleeve. After half year, the video of my first solo live tour will be released on DVD and Blu-ray. For those that came to watch the live, let’s relived the excitement together. For those that did not watch it live, I hope this will give you a feeling each time of “I must go watch the live in person next time!” and that’s how confident I am of this production! And, for the bonus documentary video, it will include my thoughts on music and the future and various things so it will be different, unlike previous Making videos and will be deeper. My long desired 1st Live tour has come true. But, I also wanted to let fans know, ‘from this point, anything can begin’, so a new song is included. With these feelings in mind, I wrote the lyrics to the song. Anyways, this is a product that you can be excited, be moved and be filled with various emotions.